I can't say for sure if we had a good day or not today. It wasn't a bad day, but I do think it's one of those days that will just blend in with all the others. We did manage to get quite a bit of schoolwork done and the kids were in a pretty decent mood. We had some struggles and difficulties but nothing real major. One of those days that is so routine and familiar nothing of interest sticks out. We all have them. There's nothing wrong with them! They can be quite comforting. To me having a routing schooling day means we've found a routine! And yet I do not like days like today. Days where we just plod along in our books and nothing seems exciting our out of the ordinary. A routine means we know how things flow and we're happy to go along with the flow of our day; making learning fun and interesting but in a natural pattern of things. A rut is when we just keep pulling out the same books, the same work, and keep plodding along; to cross the lessons off our list and they feel boring, uninspired and like something that will soon be forgotten. Evan and Alec had a sleepover together last night and I could definitely tell that Evan was tired. He was cranky and uncooperative most of the day. It didn't matter what I suggested or how much I offered to help him, everything he tried to do today was accompanied by huge sighs and eye rolls. We got a really late start to our school day since everyone made themselves scarce all morning. Yet, surprisingly, they all got a lot of work done. I guess I was just disappointed that we mostly focused on workbooks and traditional schoolwork. I was hoping for a really fun hands- on kind of day to shake things up a bit. We're all getting antsy stuck in the house doing the same thing every day, each week, all week long. I'm dying for spring and the noise level in the house is really getting on my last nerve. We need to GET OUT! Plan an activity outside the house; a field trip, a park day, a hike, anything that gets us out is different from the everyday. Look into new curriculum books. I don't do this every time, of course, but sometimes those books seem boring and uninteresting because they are! Add in a hands on project-- I'll head over to my Pinterest page and look up arts and craft projects, a fun science experiment or look for a new play dough recipe to try. Take a day off; some days we put all the work away and take a day off. We'll bake together, watch a movie together, just have fun with each other and focus on making memories together. Sadly, I did not do any of that today! I just let us move on wallowing in our rut. But I was glad to see how much we accomplished despite the way we all seem to feel. Spelling/ Phonics work-- I quizzed Alec orally on his list of words from last week and with only two wrong we moved onto the next list. The series we're using has 5 lists of words and then a review week. When I told Alec he was on a review list he asked if I could just quiz him on those words too. Not surprisingly he got most all of them correct too and we went on to work on list 7 for the week. He again asked me to quiz him first so he could see which ones he needed to work on. With three sets of list completed he figured he had done enough spelling work for the day. Evan was busy working on the floor sorting words according to word family-- -am, -at, -et, & -an. He would read the words to me; often sounding them out and then had to pick which family to put them under. We talked about rhyming words, why they rhyme, and how to sound out words that are consonant, vowel, consonant. Ian finished up a final page in his spelling book using last week's words and also passed a quiz on them. He will move onto the next word list too. I spent some time adding their words to Spelling City's website since they enjoy playing those games. Writing-- All three boys worked on writing up our March postcards for our 50 state homeschool exchange. Evan dictated to me and I wrote a final copy of his post card. Alec and Ian each wrote a rough draft and will write a final copy tomorrow. We have enjoyed our postcard exchange so much but it's been falling apart since December. We are now missing 7 postcards that we should have received and I think the lack of postcards in reply is making this a little less rewarding for the boys. Math-- Each boy spent 20 minutes on Khan Academy this morning taking turns working on their math. I'm not sure I'm loving it anymore myself. In just one day Alec has managed to complete 42% of 4th grade math. While I would never argue that Alec is not smart I don't understand how some skills can be considered mastered after he watched a 5 minute video and answered two questions on the concept. He tried to argue that he completed so much today that he didn't need to work in his workbook. I pulled up a page on converting fractions to decimals and decimals to fractions (another concept he watched a quick video on and after completing a few problems was deemed mastered) and asked him if he could remember how to do it. He did complete the page but had some difficulty; which I'm fine with but hate that Khan is no longer testing him on those skills. Ian, on the other hand, has been working on the same skill (and getting them all correct!) for weeks on end. I just don't get how the program works I guess. As long as the boys are motivated to keep working on it I'll let them but I do think some of the things they teach and the ways they teach it are quite odd. Evan worked with me to complete two pages on adding in his math workbook and Ian completed another page on measuring to the nearest 1/8 inch. Reading-- Evan wanted to read Puppy Mudge Has a Snack. We ran out of library books for him and I pulled out an old bin of early readers. I was glad to see him picking one of the more challenging books in the bin and not rereading some of our old, easier books. He did a good job and I think he's really enjoying reading about Henry and Mudge. Alec disappeared in his room for almost an hour before lunch and I discovered that he had been reading his Warriors book. Ian settled down to re-read a favorite book of his called Power Machines. I read a chapter and a half in our Harry Potter book. We only have a half chapter left in the book so Evan ran up to my room and brought down the final book in hopes that we could start it tomorrow. We also ran to the library today and listened to our book on CD in the car. History/Geography-- Each of the boys spent some time working on stuff for their history/ geography fair report. Evan colored in a map of South Korea using his markers. Ian worked on labeling the various parts of the bulldozer. He labeled three different pictures of bulldozers to show how they changed over time. Alec watched a few YouTube videos on various recipes of ambrosia and nectar trying to decide on a snack to go with his Greek & Roman God report. We also looked through and picked out a few craft possibilities. All in all it was a pretty productive day! 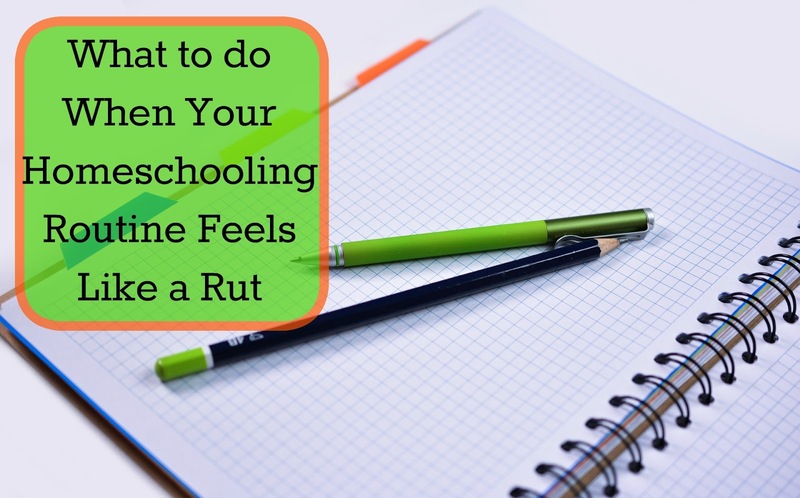 My homeschool years are now over, but I remember feeling occasionally like we were in a rut instead of just a routine (which I do love routines!). Your suggestions are good ones. It can be just a small thing to make a big difference on those days. Yeah I find just small tweaks here and there work best. I used to revamp everything and change it all up but then it seemed like change just for the sake of change and not just shaking things up a bit.